Crossing cultures, religions and continents, meditation is a practice that is used the world over for its impressive impact on our well-being. A daily dose can reap a bounty of reduced stress and anxiety, healthier sleep patterns, improved memory, increased attention span and a general sense of well-being. Many of us as adults have experimented with a meditative practice in pursuit of our own well-being. Meditation may be something that we’ve incorporated into our daily lives with great success or something that we have struggled to add to the constant juggle of our hectic schedules. But, for our children, not only are there many fantastic benefits to meditation but their young minds are primed to embrace this skill! As they absorb information and develop new abilities every day they can in turn very easily learn and adopt a meditative practice that will increase their current well-being and give them a brilliant mental tool to draw on into adulthood. 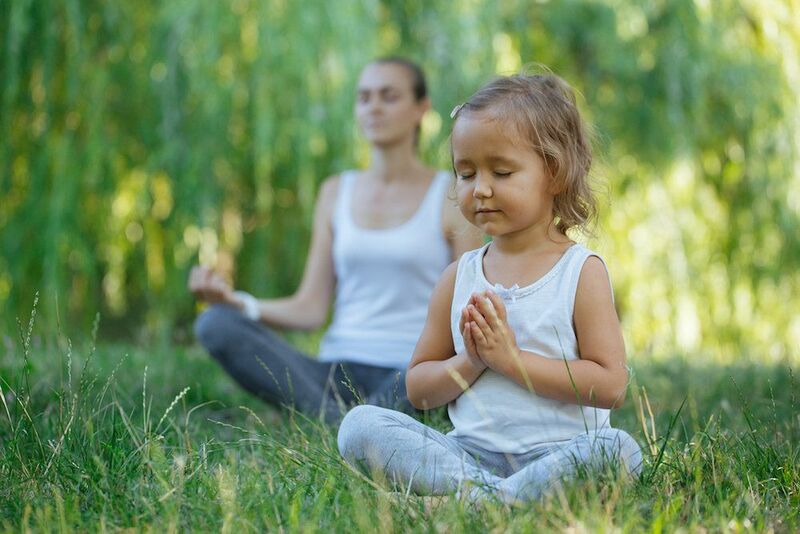 This is a wonderful gift to give to your child, and if you commit to a short meditative practice with your child each day, you will find that you and the entire family can enjoy immediate benefits. 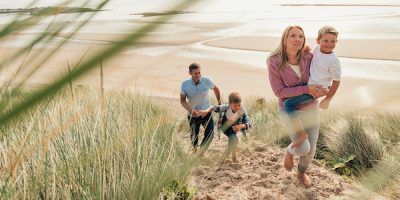 We can describe meditation to our children as simply pursuing a mental state that is familiar to all of us, but not something that we naturally know how to get to. You can imagine it’s a really beautiful day and the sun hits your faces and you have that lovely warm feeling in your bellies and a sense of well-being. When we are busy each day our minds can become hectic, but through meditation we can bring ourselves back to a happy, centred place. A great metaphor is that our mind is like a computer browser with too many tabs open. It may struggle to run efficiently because there’s too much going on. We all know a browser needs to be re-started once in a while, and essentially this is just how meditation can benefit our brains and wellbeing. By focusing on our breath we give the mind a good clear out. Once our meditation is complete we can think clearly again as the mind is re-booted and optimised! Because meditation has such an amazing history from antiquity to the modern day there are some fantastic images that you can use to get your children into the spirit of the whole idea. Meditation is most widely associated with Buddhist culture, but forms of meditation are laced through many different faiths throughout the world from Sufi traditions in the Middle East to Hindu practices in India. Greek philosophers and even Romans learned to meditate! Look for some artistic representations of people meditating throughout history. These beautiful visuals are sure to inspire your little ones! Most children these days are drawn to technology and keeping this in balance can be a challenge for parents. On the one hand we know that too much screen time is bad for their mental and physical well-being but on the other hand when a ruckus is unfolding it can be all too tempting to use a screen to restore the peace! Meditation can provide an alternative way of bringing calm to your kids, and even if this respite is only temporary, gadgets are strictly banned when it’s time to meditate! Create a nice space somewhere in your home where you are going to practice. Make it comfortable, free of distractions and perhaps try a scented candle, music or a calming image that can either be used as a focus during meditation or simply used a cue that it’s time to make the switch to a different frame of mind. Commit with your child that you are going to practice each day together. A child will inevitably have a short attention span, at least to begin with! Begin your practice at just two minutes long. You can choose the basis for your meditation but here are some ideas to start you off. Stick with a format for a week or two, then if you wish you can experiment with different techniques. You can meditate sitting with your legs crossed (you can try to teach your child to sit in a lotus position and they will likely find it easier than you do! ), kneeling, or lying down. Remember that breathing is always the key focus. With your eyes closed, focus on your breath, breathing in for a count of three through your nose and then out for a count of three through your mouth. Pay attention to the way you feel your lungs and rib cage getting bigger until they are full, then getting smaller and smaller until they are empty. Set a metronome to a very slow speed and breath in rhythm with the metronome while focusing on your scented candle or image. Count your breath as before with your eyes closed, but this time imagine a ball of light in your chest that is your favourite colour. Imagine the light gets brighter, illuminating your whole body while you practice. If you are able, pick a time each day for your meditation. Commit with your child that you are going to practice each day together, or if your schedule does not allow it, meditate together as much as you can and each time they are going to meditate without you, discuss it ahead of time and then talk about how it made them feel afterwards. If your child has difficulty getting to sleep you can introduce a meditation practice at bedtime too. Here’s a nice one to have a go at: Once they are in bed and the light is off they can close their eyes and begin to count their breath. As they breathe they can gradually imagine each part of their body getting really loose and floppy, starting with their feet, going up their legs, torso, arms, shoulders and neck, until their head too is heavy on the pillow and their mind is really relaxed. Continue the counting throughout. You can guide this meditation for them by talking them through it in a gentle voice, or if they prefer they can do it on their own. No more screens afterwards is the way to nail it. Try it out and see how positively it can impact on the bedtime routine. There are so many different techniques. Have a poke around on the internet for different breathing exercises and visualisations that you can use. Over time see if you can slowly increase the duration of your practice together. The consensus on an ideal meditation for adults is 20 minutes but every person is different, and two minutes each day is better than no minutes at all! Don’t expect too long from a young mind, be patient and allow the habit to develop naturally with your encouragement – after all they have their whole lives to explore and enjoy the benefits of meditation.